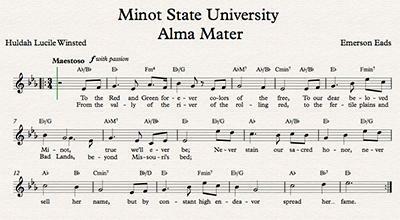 MINOT, N.D. – Minot State University director of choral activities Emerson Eads has released an updated version of the University’s Alma Mater, with lyrics from a poem by one of Minot State’s original 12 faculty members, Huldah Lucile Winsted. The Minot State University Alma Mater made its debut at the Board of Regents Fall meeting in September, and Eads hopes it will be performed at multiple Minot State events. One of the first areas of research Eads did when arriving at Minot State from Notre Dame this past summer was to learn the fight song and the alma mater. He found very little information on the latter until working with MSU history professor Bethany Andreasen. Winsted was one of the original 12 instructors hired at the Normal School at Minot, Minot State’s first name. She became the first librarian after donating much of her collection to form the first library, taught geography, served as the registrar, class adviser, and dean of women. But it was her penchant for writing, including four books – one on geography and three poetry collections – that earned her the title of poet laureate. Her “North Dakota Land of Sky and Other Poems” was published in 1927 and includes 82 poems devoted to subjects ranging from North Dakota landscapes to the progress of women in the arts. Winsted is also credited with choosing the university’s red and green colors based off the beautiful red geraniums blooming outside her office window. For Eads, taking the poem and updating the music wasn’t a long process. While Eads is hoping the song will catch on like its counterpart at Notre Dame, he knows traditions aren’t forced but embraced.